APN of Idea for Android Samsung, Micromax, Sony. 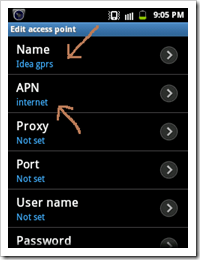 Some mobiles won’t get the apn settings directly when you insert a sim, and this makes you to call costumer care of Idea, to ask for its apn setting to run internet properly. APN Stand for Access point name. This post is to set APN of idea, while you can also find access point or apn for other service provider like Videocon, Vodafone, Reliance, Airtel, Idea, Bsnl, Tata Docomo, Aircel, Mtnl etc. I had experienced this problem in Samsung galaxy S, which made me to write about this information here. 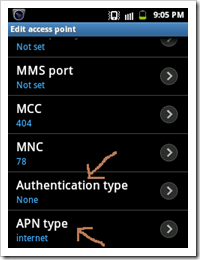 Here is the way to set apn setting in your android mobile. Share internet data, SMS or local minutes from idea to idea. We can apply this steps on every mobile but, i will demonstrate to set apn in android mobile step by step. 1. )Select Settings, then Wireless and Networks and to Mobile Networks i.e which will flow as Settings -> Wireless and Networks -> Mobile Networks -> Access Point Names (APN). For adding new APN setting, selects or click on option button of your mobile and select “New APN”, or you may even edit the existing APN by selecting edit. 3. )Dont make any changes in other fields, i.e Proxy, Port, User name, Password, Server, MMS proxy, MMS port except MNC and MCC. Fill up the fields of MCC(Mobile country code) and MNC (Mobile Network Code) according to the list provided below of your respective state. Note: Following MNC and MCC code are for the user of INDIA, for other country try to find out MNC and MCC code over internet or ask from Customer care. I suppose that, this would make your internet connection work properly, by setting apn of idea. You may also read How to make 3G or HSPA internet connection work in Android. If you are having problem in accessing internet by idea, post your comment below with the problem, so as we would look positively for the problem. Disclaimer: Although, we have taken utmost care in gathering correct APN setting of Idea service provider from our reliable resources and with our own research and experience, but we are not responsible for any inconsistency and inconvenience in accessing internet as we not a part of any of the service provider. if u have problem in connecting internet so use this account name: idea internet apn:internet. i tried all settings as per the instructions. but still unable to acess internet. Thank you for the information. It was really useful . I am using idea 2g pack in micromax a27 mobile, I am playing online teen patti game in this mobile with idea 2g. but there is problem in internet. its getting breaking internet. and my “e” symblol is lapse and come again, its working proper some time and sometime not working. my means give services like not flaqution internet. working smotthly. I was left DoCoMo for this problem. next I will left this idea also if problem not solved in 15 days.. Thank you for the information which could not provided by idea customer care,i tried several times (4 days)with idea customer care they were useless.finally i started searching web.i have got solution from your great web site,thanks a lot. I tried all settings as per the above instructions, but still unable to access internet. My handset is 2G my sim is 3g but not 3G speed what do i do? I have done the setting in my android Lava iris406Q phone but still unable to access it. Please help. Guys use this APN settings recently I got from Idea Customer care. i have Samsung mobilr model number GT-S7582 using. How to receive the setting????? what is the MCC and MNC of jharkhand state…please provide..i have samsung galaxy star.. I have a Lava Iris 349 Android phone. I followed your steps carefully and saved the settings. But, I’m still not able to connect to internet & the message still shows “no network connection”. My phone works well in a WiFi network, but, I dont know why it doesnot work in Idea Mobile Internet network. I have Micromax A44. Whenever I want to open the online job application form then it say that your device is not allow to acess this page. Please give solution. try ” Reset apn setting” by pressing left option key..and click on reset..
I’ am using Micromax A27. Please help me for getting internet connection. My micromax a106 shows roaming sign but i m at my home. Network is idea. Please help me. I have Samsung S2 (i9100) android bases phone, i have full high speed internet whenever i am out from house. Whenever i get inside my home the data get disconnected but my network bar is full and calls very clear. Dont understand the concept. kinldy help on the same. Have tried many APN types for the resolution. Kinldy assist on same ASAP. wow, i did as per this solution and lol it didn’t work. but after i saved my setting, there was an option of restore default settings. I just clicked it and viola its done. i have create all the settings but i m not able to acess internet pls provide the solution for it. im using huawei g700,the sett not supporting in my phone, it will showing 3g n internet in top of mobile,but the network section showing only up arrow mark.. Either Switch off your cell first or to flight mode. Also check if you have data balance or main balance valid. My micromax a065 shows roaming sign but i m at my home. Network is idea. Please help me. tried all settings as per the instructions. but still unable to acess internet. I m having gprs settings and also internet connection .. but whatsapp and gmail is not working.. but google is working.. what can I do now.. reply me…. network showing roaming sign.. that is RH and sometimes RH+ and then it automatically turns to E and due to this.. internet stops working when RH switches to E for sometime until it again switches back to RH.. and it makes my internet not work for very long until RH comes.. I have I ball tablet Model 3G 7803Q-900.After purchasing prepaid card of idea,i did all the settings as told by idea customer care.Still I am unable to get the internet connection.When I type the web address in URl I get the error— Authentication through proxy server was unsuccessful—.What is the solution? Thankz alot!. My APN got set. I have a solution of this.. Worked on my phone after entering apn type also. Recently I buyed a idea 3g sim Iam unable to get 3g symbol what I have to do? HOW TO ACCESS THE INTERNET SETTING. PLEASE TELL ME AFTER THE PROCESS OF APN. PLESE SEND ME GPRS SETTING ON MY NUMBER. I am using samsung galaxy grand prime but i am not able to connect 3g at all. Please help.